Bexley has outdone itself with this modern remake of a vintage classic. 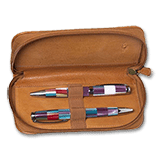 Quality plated furniture with wonderful detail will make this one of the first pens you reach for when you want to show off your pen. 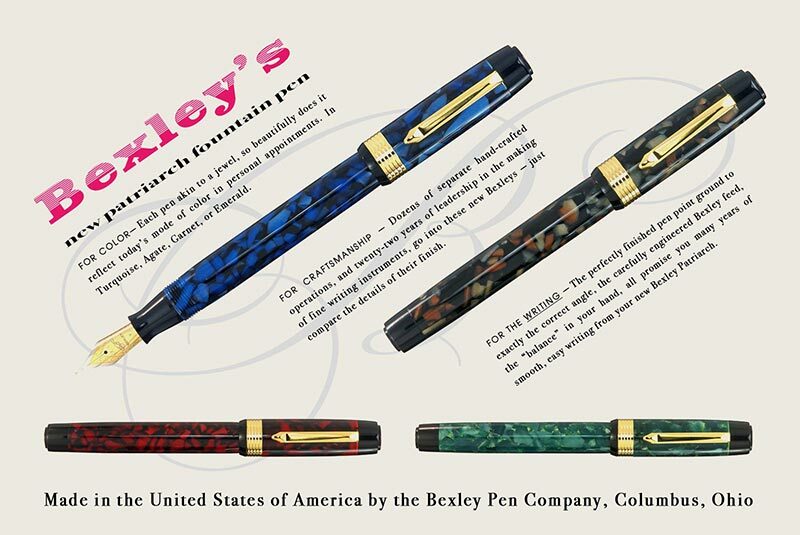 Dozens of seperate hand-crafted operations, and twenty-two years of leadership in the making of fine writing instruments, go into these new Bexleys - Just compare the details of the finish. 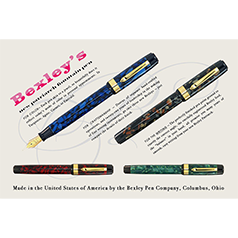 The perfectly finished pen point ground to exactly the correct andgle, the carefully engineered Bexley feed, and the "balance" in your hand, all promise you many years of smooth, easy writing from your new Bexley Patriach. Each pen akin to a jewel, so beautifully does it reflect today's mode of color in personal appointments. Fitted with top quality German made JoWo nibs in either steel, unbranded 14K Gold (optional upgrade) or unbranded 14K Gold Full Flex - the details in this pen set it apart from the crowd. Available in Turquoise, Agate, Garnet, or Emerald. The material is beautiful, the medium nib was tuned beautifully. Fantastic in every way.